The support tonight is GFOTY (standing for Girlfriend of the Year), the moniker of Polly-Louisa Salmon, who takes the stage with two male dancers to give us 30 minutes of what might be described as highspeed-rap-performance-art-theatre. Being hit by this without any warning leaves you struggling to work out what it’s all about and maybe, like going to an opera for the first time, you need to do some basic research homework first. The performance seems to be a continual narrative of social observations and comment and really is something a bit different. GFOTY is someone to watch out for in the future. 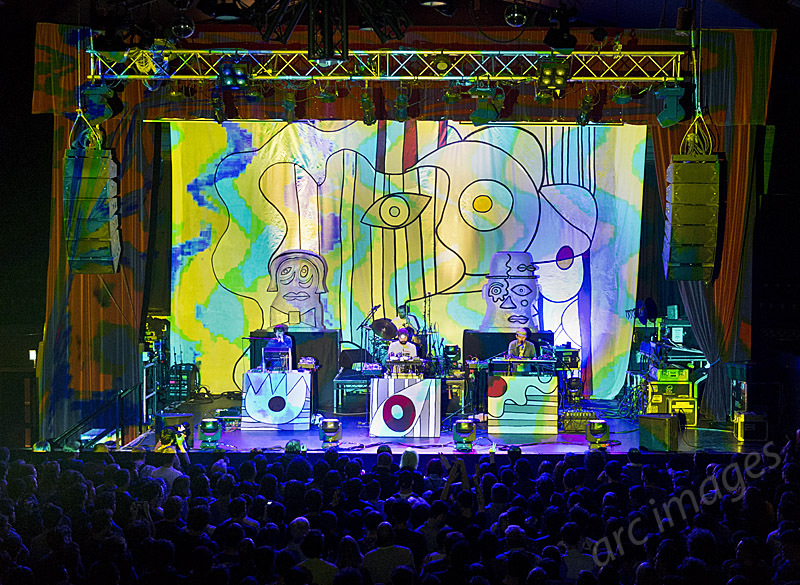 Animal Collective’s stage set for the ‘Painting With’ tour is appropriately very ‘painterly’, with a Picasso-cubist theme and including two giant plastic heads that look like Easter Island statues designed by a surrealist. Colourful psychedelic strobe lighting projected onto the stage completes the picture. Up front are three banks of keyboards / electronics, behind which are AC members Panda Bear, Geologist and Avey Tare. Centre-stage Geologist is sporting his trademark headlamp, but otherwise there’s no special dress for the occasion. To the rear, on the drum kit, is touring drummer Jeremy Hyman. 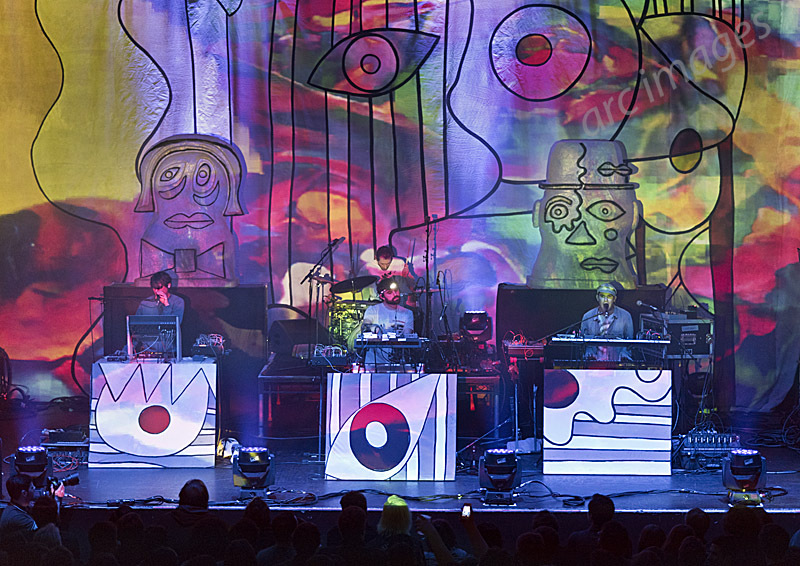 The fourth, on-off, Animal Collective member, Deakin, is absent from this tour and album. The hour-and-a-half AC gig is a seamless collage of experimental electronic jamming / beats / sounds, nevertheless with strong pop-elements like bubblegum thrown in. The band say very little and just concentrate on singing, playing the keys and tweaking the knobs on their equipment. Beside the pulsating light show there is little movement in the performance apart from a bit of gyration from the musicians, notably the jerking of Geologist’s headlamp. The set is almost entirely derived from the new album and chooses to ignore most of their back catalogue. AC appear to be a band who very much want to live in the present rather than dwelling on past glories, but it is still surprising that they choose to deprive the audience of most of the songs from the landmark ‘Merriweather’ album and even material from its follow-up, 2012’s ‘Centipede Hz’. The band’s vocals, mostly handled by Panda Bear and Avey Tare, are always interesting, including Beach Boys-style harmonies (as pioneered on the ‘Merriweather’ album), tribal chanting and hocketing (where different voices sing different parts or syllables). Some songs stand out more than others (and get a warmer reception from the audience), for example ‘Golden Gal’ from the new album, which is one of the more catchy numbers and features the Merriweather-style harmony vocals. Likewise the main set-closer, the poppy and amusingly titled ‘FloriDada’, brings the house down. The encore includes a couple of old songs, ‘Bees’ and ‘Loch Raven’, from 2005’s ‘Feels’ album. While this more ambient-style material creates welcome variation in the set, the fade-out of ‘Loch Raven’ into the following song is really too long, noodling and repetitive, which highlights a limitation of tonight’s set. AC could have included more pace, as well as variety and texture in the set and could have re-visited more of their back catalogue. As it is, the unbroken beats become rather relentless after the mid-point of the set, leaving the audience gasping for a reference point and a break. Overall Animal Collective remains dynamic, experimental, forward-looking and interesting and not like any other band you will hear. However, maybe they need to think a bit more about the content and pace of their live sets and let the fans hear more of ‘the hits’. Setlist: Hounds of Bairro; Vertical; Lying in the Grass; Gnip Gnop; Golden Gal; Recycling; Daily Routine; Summing the Wretch; Natural Selection; Alvin Row; FloriDada. Encore: Bees; Loch Raven; The Burglars.